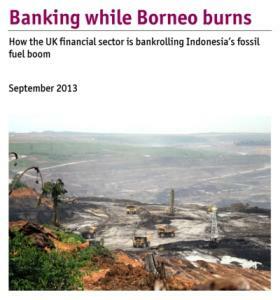 The report and films expose the UK financial sector's bankrolling of Indonesian fossil fuels for export. They include information about the Kalimantan coal operations of Bumi and BHP Billiton's new coal-mining development in Central Kalimantan. They show directly the devastating impacts of Kalimantan's 'coal-rush' on local communities, their livelihoods and their environment, as well highlighting the wider implications for climate change. For more information on Bumi and BHP Billiton, visit our coal campaign page. See also JATAM's website for more information on campaigns in Indonesia.